Controlled fluid deposition: fluid deposition using digital inkjet technology is extremely predictable and repeatable, allowing for more precise control than can be achieved with analogue processes. Flexible integration and manufacturing: each pattern digitally produced can be different, reducing batch sizes and inventory as well as shortening time-to-market. Efficient processing: digital inkjet technology avoids tooling, materials and set-up procedures; replacing multiple processes to achieve faster turnaround times and lower production costs. As an inkjet innovator, we are focused on developing these applications using the technology built into Xaar’s latest range of Advanced Manufacturing (AM) printheads which allows inkjet to be applied in both scanning and single-pass modes, making digital inkjet printing a realistic choice for high output in-line batch and roll-to-roll production. We have a professional team working closely with manufacturers, fluid formulators and specialist printer makers to bring these new processes to market with our printheads and technologies. With access to innovative technology and inkjet expertise from the leaders for over 25 years, get ahead of the competition and achieve more with Xaar. Fast response to issues, application improvements and new technologies. Digital inkjet is the creation of small, uniform droplets which can be jetted accurately and with precision onto a wide range of substrates such as silicon, glass and plastic film. 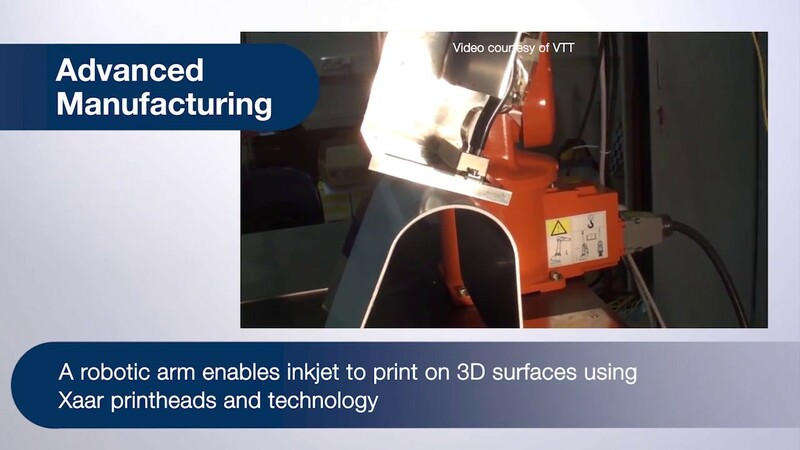 This technique offers advantages over established print and coating processes and enables emerging fabrication methods such as 3D Printing and nanoimprint lithography. The digital inkjet process is increasingly considered for functional fluid deposition processes across a broad range of industrial applications. Manufacturers are looking to drive down the cost of manufactured goods across diverse industries; a reduction in processes, fewer consumables and less material waste all contribute to improved manufacturing efficiency whilst the ability to print on demand allows for customisation and personalisation. As an example, the schematic opposite illustrates the versatility of Xaar printheads to jet functional fluids for a wide array of deposition processes involved in mobile phone manufacturing. Perfect for very small drop fluid deposition on an industrial scale, the Xaar 1003 AMp is capable of consistently jetting droplets as small as 1 pL for the production of fine features, patterns and coatings.